LOS ANGELES (AP) - Suzanne Pleshette got a star on the Hollywood Walk of Fame on Thursday, less than two weeks after she died of respiratory failure. On what would have been her 71st birthday, Pleshette received the walk's 2,355th star. The husky-voiced television, film and theater star died Jan. 19. She underwent chemotherapy for lung cancer in 2006. She was best known for her role as Bob Newhart's wife on "The Bob Newhart Show," a CBS comedy that ran from 1972-78. 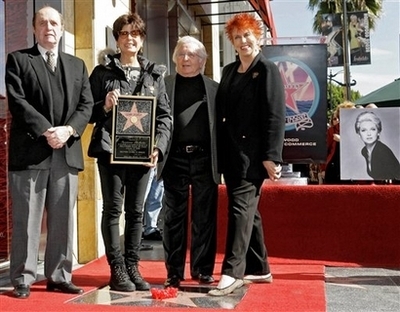 Newhart attended the star's unveiling, which had been planned before Pleshette's death. "The only thing that exceeds her talent and her beauty was her bravery, because she was one of the greatest women," Newhart said. "Many people walk through your life and very few people leave footprints on your heart," said Marcia Wallace, another "Newhart" co-star. "She left footprints on my heart, and now we can all leave our footprints on her star. She'd love it." Tina Sinatra, a daughter of Frank Sinatra, accepted the star on Pleshette's behalf. "The thought of her with Johnny Grant really makes me feel better," Sinatra said, referring to Hollywood's longtime honorary mayor, who for years presided at star unveilings before his death on Jan. 9.